Ash trees are bare and golden birch leaves are falling rapidly. Maple trees — red, silver and black species — smolder in shades of red, orange, gold and yellow on Saint Paul’s boulevards. A mild, sunny day with strong, gusty southwest winds pulled many leaves from the trees, piling them in corners, catching them in bushes and long grass, and decorating all things still green with the fire of autumn. Several species of maple display their colors on our St. Paul, MN, street. 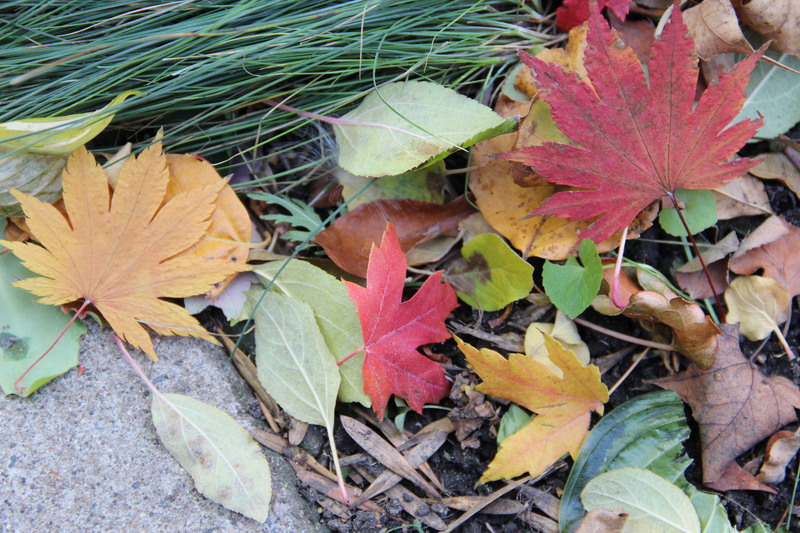 A southwest wind blew together a small pile of maple leaves, apple leaves and ash keys nestled next to blue fescue ‘Elijah blue’. 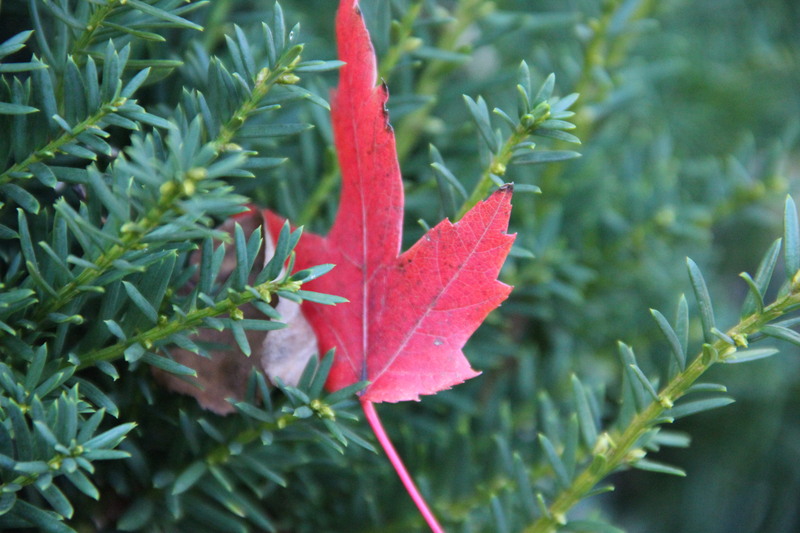 An ‘autumn blaze’ maple leaf glows against a deep green yew where the wind trapped it. 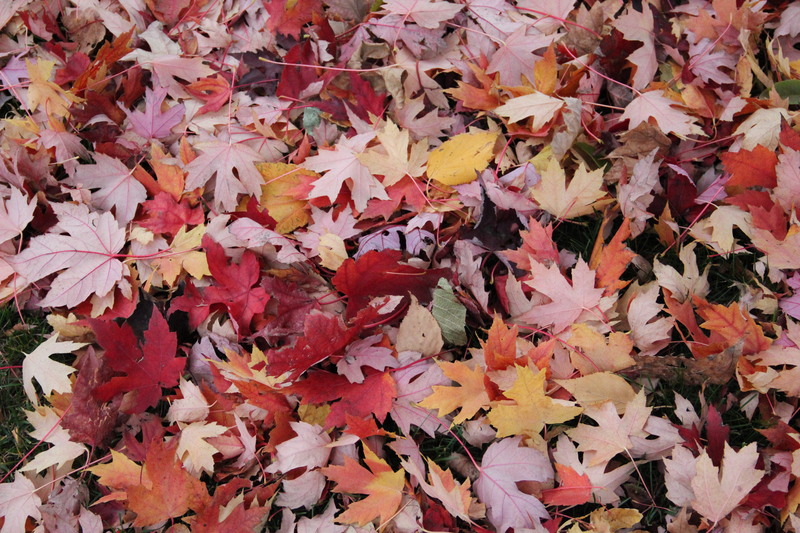 A bright patchwork of maple leaves decorates our front lawn. This entry was posted in Autumn, Nature Photography, Saint Paul, MN, Trees and tagged Autumn, Leaves, Maple tree. Bookmark the permalink. I love the way you write. It reminds me to slow down and take in the beauty around us that we so often take for granted. It was hard to come out to the hard frost this morning and reports of 3-5 inches of snow overnight. I plan to store up your pictures and writing to read and view again and again over the winter months. I have a feeling you will find ways to remind us all of the beauty we can find around us in the cold months as well. Thank you, Connie. 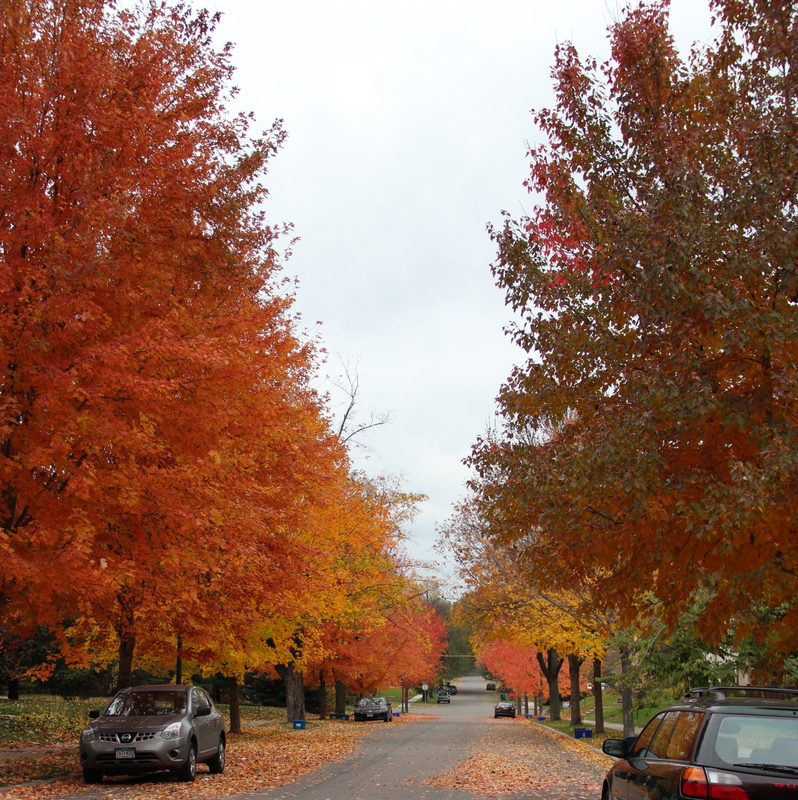 The maples are dropping their leaves quickly now, but they still add beautiful color to the neighborhood streets! Thank you, Cathy. The beautiful autumn trees bring back memories of when we used to hike through the Eagan woods and fields before they were developed. Thanks for reading my blog!